In celebration of National Ice Cream Month, we've brought you delcious ice cream treats all week long. Check out the list below if you missed a day. 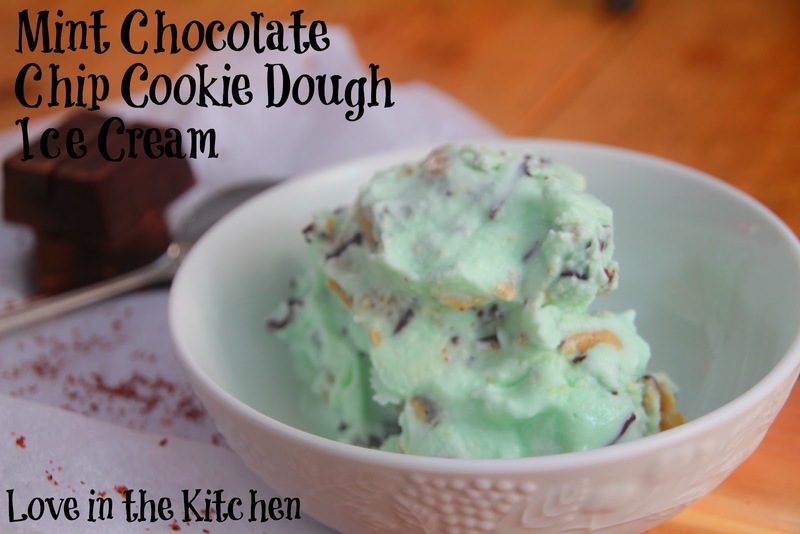 Before we give our ice cream maker a well-deserved break, we wanted to share one last variety: Mint Chocolate Chip Cookie Dough. Before our Summer Ice Cream Social started, I asked my husband his favorite flavor of ice cream. 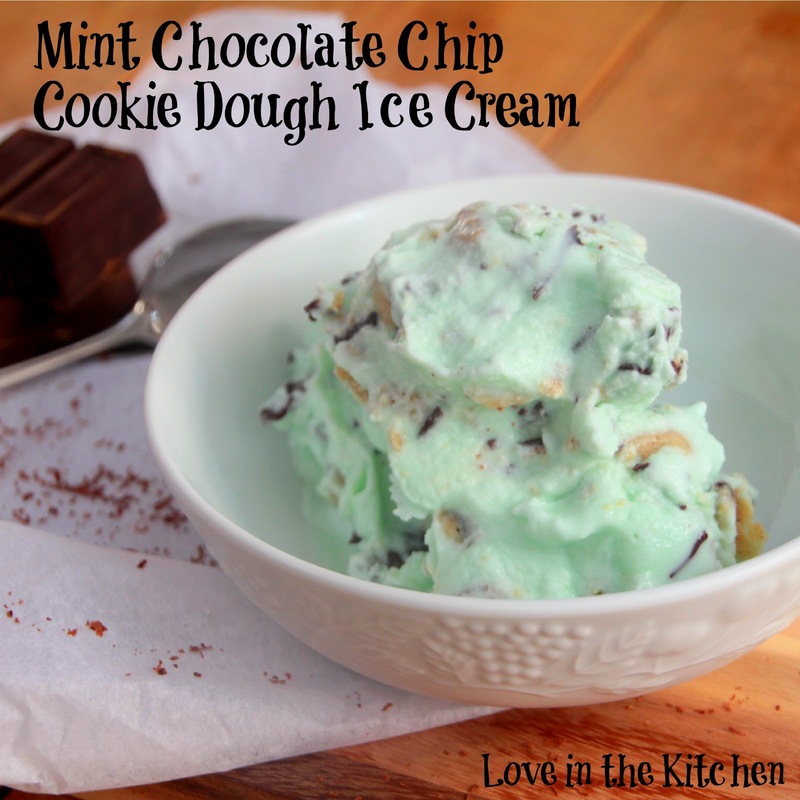 He couldn't decide between mint chocolate chip and chocolate chip cookie dough. When I said I would make both, he said "you should make them together!" Turned out to be brilliant! 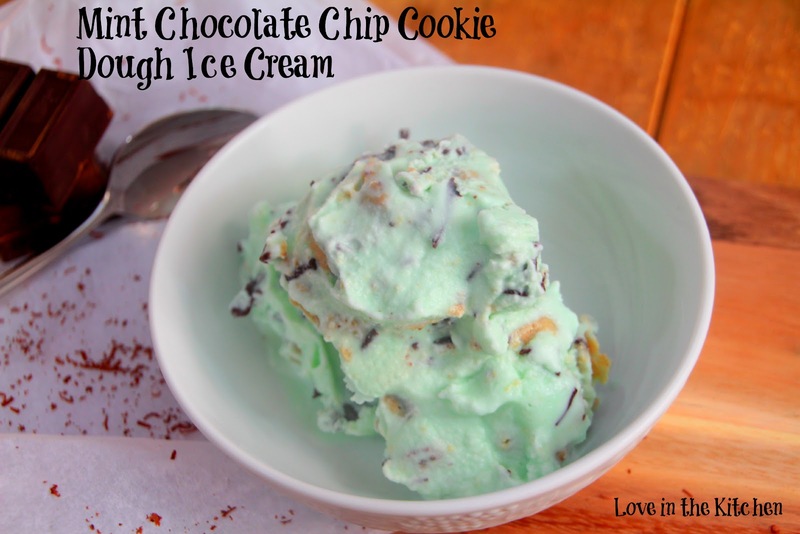 Mint chocolate chip ice cream is so sweet and refreshing - add chocolate chip cookie dough (one of my favorite things ever) and you've got the Best. Ice. Cream. Ever. Easy to make too - see how below! Stir together the milk, cream, half and half, sugar, salt and peppermint extract. Mix until the sugar has dissolved. If using, add drops of green food coloring until you have the green color you want. 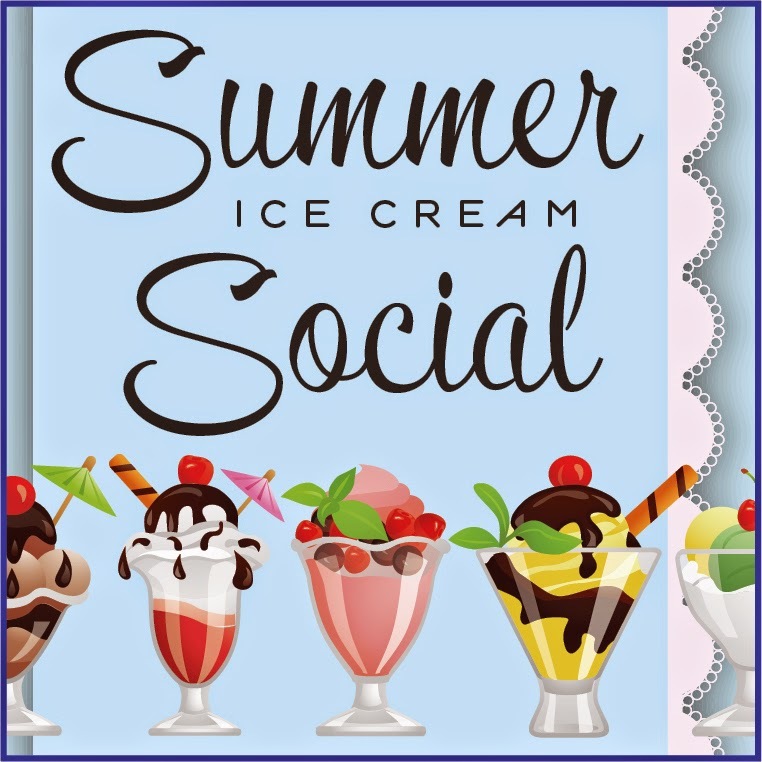 Churn the cream mixture in an ice cream maker for about 25 minutes or according to the manufacturer's instructions. Meanwhile, melt the 6 ounces of semi-sweet chocolate pieces in the microwave for 30 seconds. Stir and continue melting in 15 second intervals until the chocolate is melted and smooth. Let cool and transfer the chocolate to a heavy-duty plastic ziploc bag. When the ice cream in the machine is ready, snip a corner off the plastic bag and scribble some of the chocolate into the container, then add a layer of the just-churned ice cream to a storage container. Scribble melted chocolate over the top of the ice cream, then quickly stir it in, breaking up the chocolate into irregular pieces. 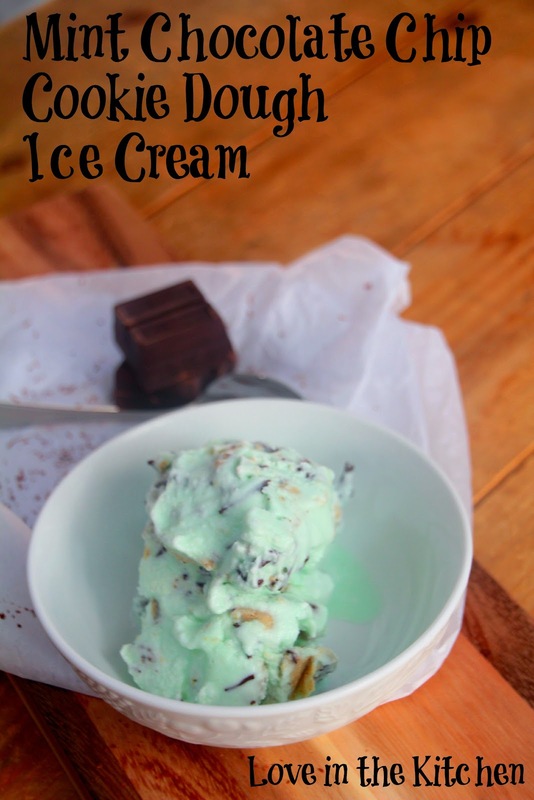 Continue layering the ice cream, scribbling more chocolate and stirring with each layer. Put the ice cream into the freezer and freeze for about 20 minutes. Now, make the Cookie Dough: Cream the butter in a mixer until soft and fluffy. Add both sugars and mix. Add the vanilla and eggs and mix. Add the flour, baking soda, and salt and mix. Add the chips and mix just until just combined. Remove the ice cream from the freezer, and fold in the chocolate chip cookie dough (you may not need all of it - bake any leftover cookie dough into cookies at 375 for 10 minutes). Freeze the ice cream for at least two hours and serve.